Life does not give you second chance. A small mistake done by you can cost you a money. You should avoid doing a mistake that cost you a money. It is true that Money is not the most important thing in life, but money does affect everything that is important to life. So, it is absolutely essential to manage money in effective manner. So, here is 15 small mistakes people does which cost them money. You should avoid these mistakes. 1. You forget to track your spending – You should evolve a mechanism of tracking your spending. Make a habit to note down your expense. Not tracking your spending means inviting cost which you are not aware of. 2. Investing money without Financial Planning – Another most common mistake that can cost you big money is investing money haphazardly without doing proper financial planning. 3. Not Making Emergency Fund – You should be financially prepared to handle any eventuality in life. Not making emergency fund will cost you money. 4. Investment in stock without proper research – You should not invest in a stock market without doing proper research. Investing in stock market is a risky affair and you may lose all your hard earned money. 5. Don’t put all your money in a single basket – You should diversify your portfolio, please don’t keep all your money in a single basket. Keeping all money in a single basket will cost you money. 6. Not taking Medical Insurance for family – Not taking medical insurance is another most common mistake you should avoid. A medical emergency can turn up anytime and can eat your savings. 7. Not doing routine car maintenance – Car is a necessity today, If you are owning the car you must go for regular car maintenance this involves tuning, change in oil, filter etc. This it to avoid major future repairs. 8. Not renewing your car insurance – Another common mistake related to a car is not renewing your car insurance. 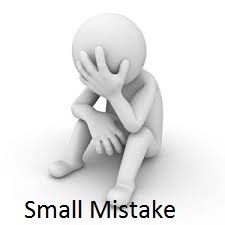 It is a very small mistake, but it can cost you lot of money. 9. Failing Credit card payment date – Make sure that you pay credit card bill in time. If you miss credit card bill payment you need to be ready to pay a lot of interest. 10. Taking personal loan – Another small mistake which can cost you big money is taking a personal loan. You should avoid taking a personal loan. A personal loan will cost you big money. 11. Buying things without usage – Before buying any product you should be clear that it is absolutely necessary. Buying product without usage is a waste of money. 12. Buying cheap quality products – Don’t get attracted with cheap product available in half price. Buying less costly things save your money but cheap quality does not stay for long. You should buy a quality product. 13. Dining out and party more often – If you are daily visiting expensive hotels for lunch or dinner you should avoid that. If you have a habit of organizing party more often probably you should avoid that. Dining out and party more often will cost you lot of money. 14. Smoking and Drinking – Smoking kills but who cares. Smoking and drinking is part of our lifestyle. It is an easy way to reduce stress. Whatever be the reason, both smoking and drinking will cost you more not only that it may cause health related problems like cancer, kidney failure etc. 15. Not tracking smartphone expense – Another common mistake which people does is not looking at expense associated with the smart phone. Value added service and Internet connections like 2G, 3G and 4G are an added expense in your monthly expense list. You should evaluate this expense that cost you money. List down what mistake you are doing which is costing you money. Try to avoid these mistakes, it can save you big money down the line. Don’t forget to leave your comment below, because your comment and suggestion will help me in writing better content in future. « How to use ICICI Money2World for outward remittance?